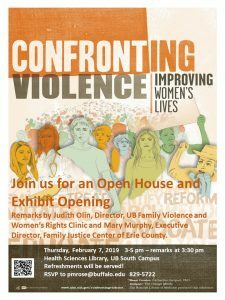 The Health Sciences Library is pleased to host an Open House and the Opening of the exhibit, “Confronting Violence: Improving Women’s Lives”, produced by the National Library of Medicine. This six-banner traveling exhibition celebrates the pivotal role played by nurses, who mobilized the medical profession to tackle the problem of domestic violence. The panels display images, manuscripts and records that tell the stories of the nurses who witnessed the effects of domestic violence and campaigned for change. NLM also has an online version of the exhibit. In honor of highlighting this important issue, we have invited two speakers who are intimately involved with domestic violence. Judith Olin, Director, Family Violence and Women’s Rights Clinic in UB’s School of Law, and Mary Murphy, Executive Director of The Family Justice Center of Erie County. Judith will speak on: The Influence of Dr. Jacqueline Campbell, RN, PhD on the creation of the High Risk Team Model”. Mary will talk about the Family Justice Center and her group of survivors (a few dozen incredible women) who weigh in day in and day out on how best to serve their clients, and their new ReachOut initiative involving a standalone website with videos on how to have the conversation with someone you suspect may be in an abusive relationship. Staff will also be on hand to offer brief tours of the library and its magnificent and historic Reading Room, as well as our History of Medicine collection that includes Nursing books and artifacts.